Home / Supplements / Which Is The Best Pre-Workout For Beginners? Find Out Here! When it comes to training, pre-workouts are often used to help boost focus and strength in the gym. 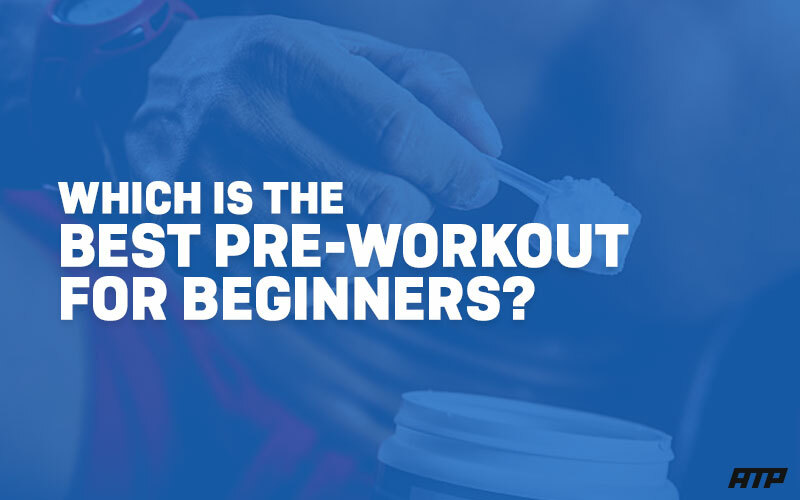 But, which is the best pre-workout for beginners? Well, we went in search for the top beginner friendly pre-workouts that you can use to help boost your next training session. What Exactly Is A Pre-Workout? A pre-workout is any supplement that claims to boost gym performance. It is usually taken 30-45 minutes before a workout in the form of a drink. Most pre-workouts contain scientifically researched ingredients that are proven to boost performance. These ingredients include things like caffeine, citrulline, BCAA, , creatine, beta-alanine and electrolytes. What Ingredients Should You Look For In A Pre-Workout? When looking for a pre-workout it is important to make sure that it has the right ingredients. This way you make sure that you are getting the most optimal performance gains for your money. Caffeine has been used to boost performance for ages and is one of the main ingredients you will find in a pre-workout. Caffeine works by decreasing your rate of fatigue and lowering the perception of effort, this results in an increased work load. An optimal dose of caffeine will be around 120mg-400mg per serving. BCAAs (Branched Chain Amino Acids) refers to three amino acids: leucine, isoleucine, and valine. These 3 amino acids help prevent the break down of muscle and help to improve muscle endurance when taken pre-workout. BCAAs also help in preventing delayed onset muscle soreness (DOMS) which can help you get back to lifting faster. An optimal dose will be around 5g to 10g per serving, in a 2:1:1 ratio. Check out our post on the best BCAA supplements for more info. Beta-Alanine has been shown to increase muscle endurance and has been used by athletes for a few years now. What Beta-Alanine does is buffer hydrogen ions (H+), which means you will be able to keep up your training intensity for longer and be able to push out a few more reps. An optimal dose will be around 1.5g – 5g, however, at this dose you will probably notice some sort of tingling sensation. Creatine is naturally occurring amino acid that’s found in meat and fish and also made by the human body in the liver, kidneys, and pancreas. Creatine helps to regenerate a molecule called adenosine triphosphate (ATP), your body’s main source of energy. When creatine stores in your muscles are depleted, the production of ATP comes to a screeching halt and your energy is dramatically decreased. Taking creatine increases the available fuel to power ATP. Creatine does produce some great results in most people. Athletes who have taken creatine have found that they notice an increase muscle growth and athletic performance. ​ Check out our post on the best creatine supplements for more info. L-Citrulline Malate is metabolized to form L-Arginine and as a result, regulates Nitric Oxide production (this helps increase muscle pumps). A pump is probably the most satisfying feeling in the gym and is an important factor in muscle growth. An optimal dose of L-Citrulline will be 6g-8g per serving. Cycling your pre workout is important to avoid adrenal fatigue and from your body developing a tolerance to the pre workout (meaning you will have to take more to get the same effect). When it comes to taking pre-workout it is generally recommended to do 6-8 weeks on, 1-2 weeks off. Pre-JYM is one of the best selling pre-workouts on the market with over 4200 reviews. 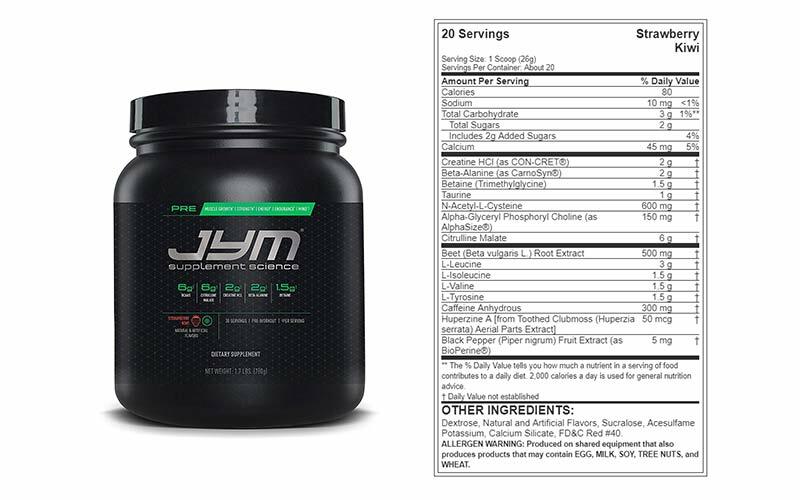 Pre-JYM uses clinically proven ingredients at proven effective doses to provide an advanced all-in-one pre-workout formula designed to optimize your workout efforts. What I like about this pre-workout is that you get to see just how much of what you are getting, so no proprietary blends. 6g of BCAAs (2:1:1 ratio) – BCAAs help increase muscle performance, growth and help to reduce fatigue. 2g of Beta-Alanine – Helps boost muscle endurance. 6g of Citrulline Malate – Helps to increase muscle pump and endurance. 2g of Creatine HCL – Increases muscle strength and muscle growth. 300mg of Caffeine – Boost performance, increase focus and drive. Mr. Hyde is manufactured by ProSupps, a well respected supplement company within the fitness industry. 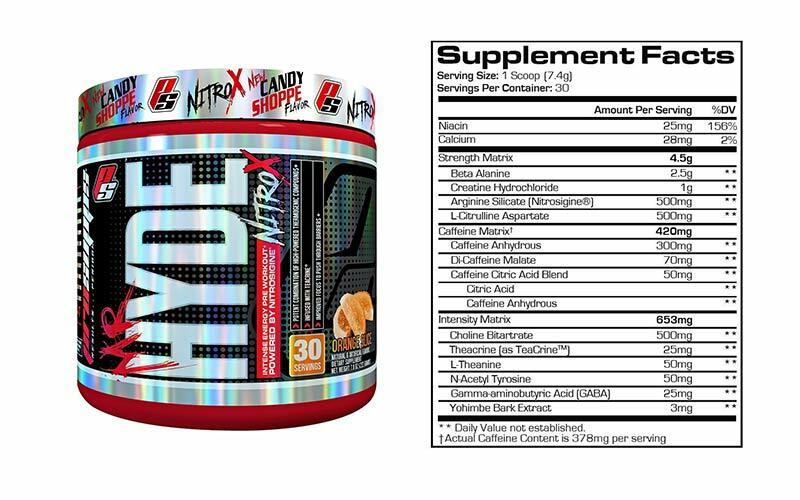 Mr. Hyde features extreme energy, pump and great mental focus. Mr. Hyde contains a combination of effective ingredients to help boost your next workout. 2.5g of Beta-Alanine – Improves muscle endurance. 1g of Creatine HCL – Increases strength. 500mg of L-Citrulline – Helps with muscle pumps and endurance. 420mg of Caffeine Matrix – Provides the massive energy. 3mg of Yohimbe Bark Extract – Increases bloodflow. 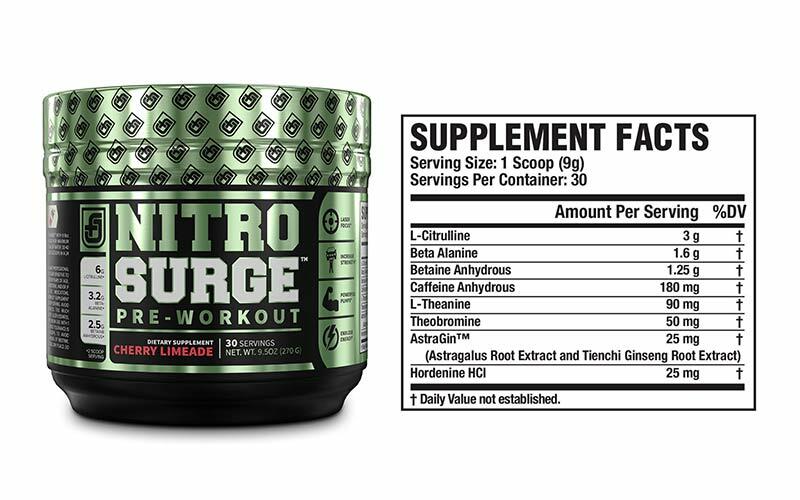 Nitrosurge is manufactured by Jacked factory, a relatively new brand to the fitness industry, but one that has received tons of great reviews so far. You’ll notice that with this pre-workout the ingredients are simple and scientifically proven to provide the most optimal results through premium, proven ingredients. 1.25g of Betaine Anhydrous – Learn more about this ingredient here. Universal Nutrition was founded in 1977, which means they are one of the oldest supplement companies on the market and have been producing a lot of top quality products. 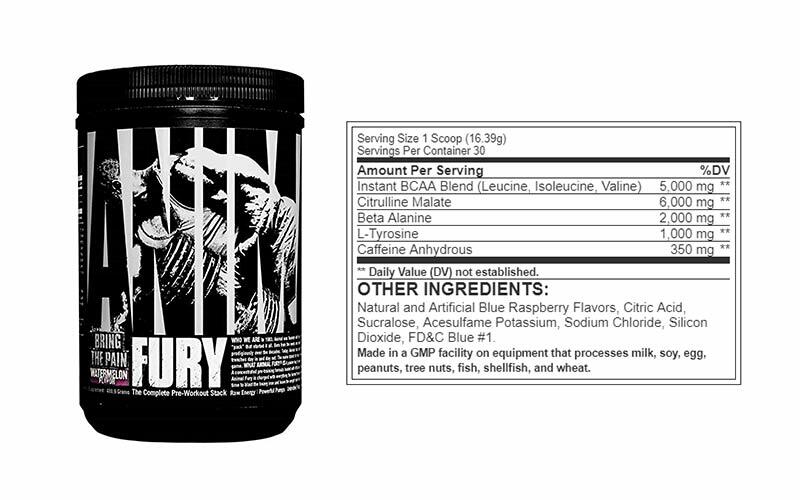 The first thing you will notice with Animal Fury is that it has a small ingredient profile which is great because that means there are no propitiatory blends and you can see exactly what you are getting. 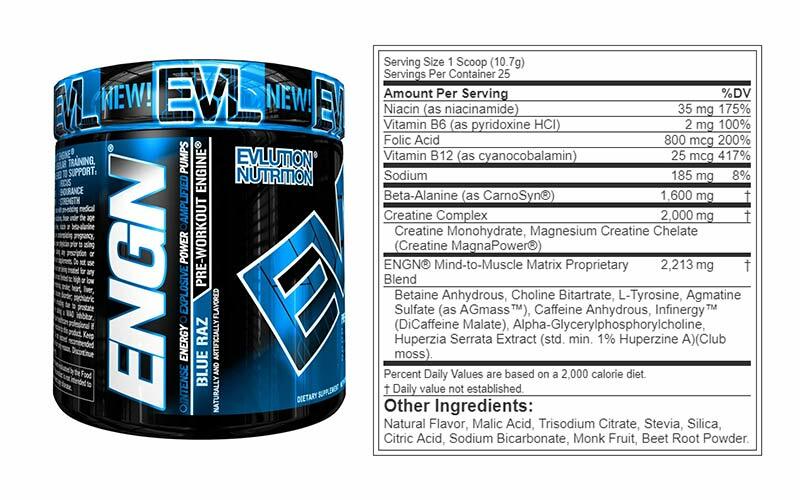 EVL is a Florida based company who are also relatively new to the supplement industry, but their products have been very popular on bodybuilding.com, and for good reason. ENGN has over 2600 positive reviews, good list of ingredients, and comes in 7 different flavors. Hopefully, you have a better understanding on which pre-workout to choose. Our top pick would be Pre-JYM as the best pre-workout. However, all of the pre-workouts on this list will get you the boost you need for training!